The BodyFriend Rex-L is a fantastic, well-designed top-end massage chair, packed with innovative features and surprises that both hobbyist and therapeutic users will love. This chair is recommended for anyone. Are you the kind of person who just has to have the latest technologies, gizmos and gadgets the moment they come out of the market? If so, then you’re going to love our “First Look” BodyFriend Rex-L massage chair review. If you’ve never heard of the brand BodyFriend or their product line, you’re not alone. They’re just currently making their way to the United States. Fortunately, we’ve gotten a sneak peek of one of their best sellers, which we’ll share with you in the sections that follow, outlining everything this new model has to offer. The Rex-L utilizes cutting-edge massage chair technology, incorporating quad rollers that closely mimic the feel of human hands and an ultra-long massage track that allows them to massage beyond the small of your back, under the seat to your glutes and the backs of your thighs. Each time you sit on the chair, and before your massage begins, the on-board computer takes a scan of your body and makes small adjustments to the width of the massage field and the position of the rollers, making sure they conform to the shape of your body and hit all your pressure points. If the tech doesn’t quite get it right, there’s also a fallback position. The remote has buttons on it that allow you to adjust both those elements manually. This two-pronged approach ensures that you always have a perfect massage experience. Inspired by NASA, ﻿Zero﻿-G seating is a highly attractive feature that enhances the overall experience. By reclining to a position such that your knees are elevated slightly above your heart, it uses your body weight to press more firmly against the rollers, allowing for a more penetrating massage. Unfortunately, we were a little underwhelmed in this instance, because there’s only one seating position on offer. Given that this is a high-end model, with a high-end price tag, we would have expected at least two, and preferably three, but at the end of the day, this is a minor gripe. This is a fantastic feature that makes the BodyFriend Rex-L perfect for home use. One of the biggest problems with massage chairs is that they’re huge. They totally dominate whatever room you put them in, and to use most of them, you’ve got to set them fairly far from the wall to be able to recline fully. Chairs designed with Space-Saving Technology only require about four inches of clearance between the back of the chair and the wall you set them near. This is possible because as you recline, the chair pivots on its base. An ingenious bit of engineering that adds a nice, futuristic touch. These are adjustable via the remote through five different speed and intensity levels, giving you a surprising number of possible combinations, despite the relatively number of massage techniques. Where the model really shines, though, is in the area of user-friendliness. There are a total of nine pre-programmed massage options available at the touch of a button, making it highly convenient and easy to use, even for users who aren’t as tech-savvy. ​​​​Golfer – Focusing on the shoulders and upper back. Student – A waist-focused massage for those who sit for extended periods. Hip-And-Up – Exactly what it sounds like, utilizing a combination of kneading and Shiatsu. Relax – Shoulder, back and ﻿waist ﻿massage using maximum intensity Shiatsu. Refresh – A brisk kneading & tapping-based massage designed to perk you up. Sleep – Tapping for the back, combined with a foot massage to gently relax you to sleep. Stretching – Body Stretch – Covered in a separate section. Upper Body – Exactly what it sounds like. Lower Body – Exactly what it sounds like. ​​​​Featuring an impressive 98 Second Generation Airbags, there aren’t many massage chairs that can match the Rex-L on this front. In fact, the only model we’ve ever seen with more is the mighty ﻿Inada ﻿Dreamwave (which has 101). That, however, is just the beginning, and our BodyFriend Rex-L review wouldn’t be complete if we didn’t call particular attention to this next innovation. Every other massage chair we’ve seen utilizes a gentle “squeeze and release” type air massage, but BodyFriend has a patented process that renders an excellent Shiatsu massage, via airbags. You might struggle to believe that (we did too! ), but it’s true, and it feels amazing. We’ve never felt or seen anything quite like it. ​​​​This is yet another exceptional feature-implementation. Only a minority of massage chairs on the market today even offer heat and most of the ones that do offer it only in the lumbar region. The Rex-L exceeds expectations by offering both calf and back heat that spans approximately the lower third of the back, which is an excellent therapeutic addition. This is a powerful healing feature offers almost immediate pain relief to ﻿chronic ﻿pain sufferers by taking pressure off compressed discs in your spine in much the same way that a chiropractic adjustment does. The BodyFriend’s stretch is basic but quite aggressive, and if you suffer from ﻿﻿acute ﻿﻿pain, it may be too intense for you to handle. If that’s the case, it is recommended that you warm up by enjoying a massage with heat to loosen your back, then try the stretch. As you may have guessed, the calf and foot massage is also exceptional, thanks in no small part to the vast number of airbags the chair sports, and the heated leg massage ports. The calf portion of the massage is rendered entirely by airbags, while the soles of the feet are treated to a tri-roller foot massage that will relax and satisfy. If you spend several hours of each day on your feet, the heated calf and foot massage is almost sure to be your favorite aspect of the chair. The B﻿odyFriend Rex-L wouldn’t be much of a high-tech wonder if it didn’t offer Bluetooth MP3 compatibility, now would it? So of course, it’s also featured in the design. The company didn’t skimp on the speakers, either. You’ll get rich, full-bodied sound and plenty of bass, whatever your musical preferences! Yes, it even has an extendable Ottoman, which makes the chair suitable for people up to 6’4” in height. It seems clear that the folks at BodyFriend tried to think of everything. The remote is well designed and laid out, but given all the features this chair has to offer, it is a given that there’s going to be a bit of a learning curve here. The company has taken steps to make it as user-friendly as possible, and with the pre-programmed massage options available at the touch of a button, you can still be relaxing in your chair and enjoying your first massage in a matter of minutes, but make no mistake, there’s a learning curve here. Having said that, once more, the company exceeds expectations. The chair is “smart” and can talk you through using the features (in three different languages, no less). Once you’ve mastered the device, its voice can be disabled from the remote, but until then, it will show you the ropes! In addition to that, there’s a control panel on one of the chair arms with an abbreviated set of controls (power, recline, just the basics, but very handy). Whew! Okay, so clearly, a lot of features in this model, and it’s almost a given that BodyFriend Rex-L﻿ is destined to become a major player in the US market, based on the strength of their debut effort. Having said that, we did take off points for a couple of things we felt were lacking. The first is the fact that there’s only one Zero-G seating position. Again, this isn’t a huge deal, but the Rex-L is expensive. We were expecting more. Second, we’d like to see a second, advanced massage technique. Perhaps ﻿﻿﻿﻿Swedish﻿﻿﻿﻿? Finally, memory slots. It would be great, and completely in keeping with the high-tech concept of the chair to be able to program your favorite settings, then save them for later use. Sadly, you can’t – at least not yet! We loved it. You’ll love it too. It’s sleek, modern, beautiful, and extremely polished. It also features some genuine innovations that blew us away, and we recommend it without hesitation to anyone. 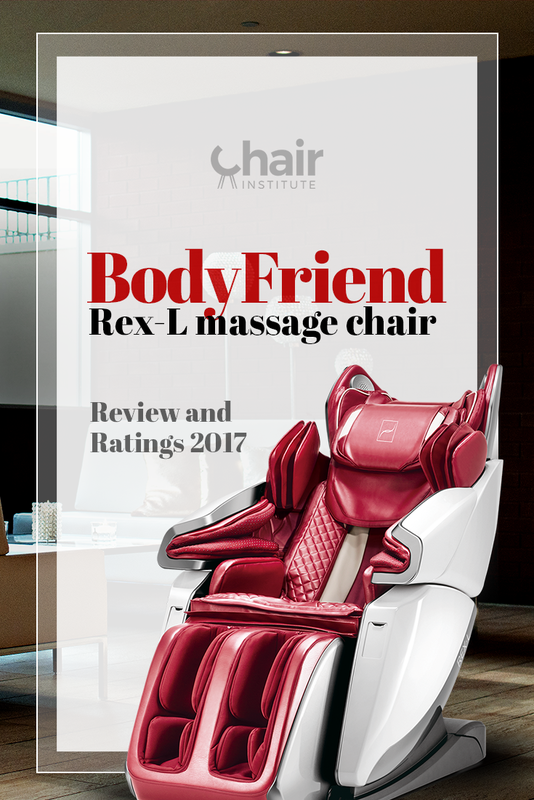 BodyFriend Rex-L Massage Chair, Official Brand Website. BodyFriend Rex-L at CES 2017, CNET. T﻿﻿he Benefits of Stretching, Massage Therapy. 3D Body Scanner, Cornell University College of Human Ecology. Massage Therapy for Shoulder Pain, Pain Science.